Woohoo! Time for another round of Blogging without Borders, the biweekly series about stepping out of our comfort zones and trying new things. I’m not actually going to show it to you today, because I’m hoping by the next (and last!) Bloggers without Borders post, I’ll have the final reveal for you! And I don’t want to spoil the surprise. And I’m kind of a jerk. …really thinking about what *I* love when I make design decisions. Digging into what kind of room I want to live in, what colors make me happy and what makes a room feel like home to me. My friend Darlene at Fieldstone Hill has an amazing series going on right now called Overcoming Your Decorating Paralysis, and she’s inspired me to do some research into my own tastes and decorate for that, rather than what is trendy right now, or what everyone else is doing, or what I think other people would think is beautiful. When you LOVE looking at photos of houses and seeing how other people decorate, it’s easy to see a room that looks beautiful and want to replicate that look. And suddenly making decorating decisions feels impossible, because every time you choose something, you are simultaneously NOT choosing a million other things that could be beautiful. But I’m learning how to allow myself to like something – even love it – and accept that I don’t have to use it in my house. This room is stunning. I love to look at it. But I don’t want to live there, because it’s not me. I want to live around color, so I’m learning to give myself permission to acknowledge that rooms like this are gorgeous, but I don’t have to do this in my home. This color is all over my closet. When I’m buying clothes, if I have a choice, you can bet it’s probably going to be teal. I’m so predictable. I hate being predictable. …and these are now my favorite rooms in the house. They make me happy. They have long-term staying power for me, because they are in line with my tastes, not necessarily the trends. I still love my curtains, and for me to like something for any amount of time is kind of a big deal. We shall be together in sickness or in health as long as both shall live. …So, if all goes according to plan, those will be some of the elements I’ll be bringing in to my laundry room redo. And maybe when the room is done, you’ll hate it. Maybe you’ll wonder what I was thinking. But that’s cool: you don’t have to like it. All I’m hoping for is that you’ll come away feeling like you have permission to go forward and choose the colors and the designs that speak to you in your home. Am I crazy that this is a revolutionary idea to me? Have you ever dealt with decorating paralysis? What sort of design elements withstand the test of time for you? UPDATE: See part 1, part 2, part 3 and part 5! this was a great post- it is hard to find what you really love! we have been in our house less than one year, and my dining room has already changed a few times…. You’re speakin’ my language! I’m honestly a bit terrified of actually buying a house (which may be happening soon!!) and then having to decorate it. I tend to run from the trends because I know they will soon ‘untrend’ and then I’ll want to change it. I’m going to check-out the series to give me some confidence to do things my way…and not the way of the people surrounding me! This is also why I’ll never be one of those people who completely paint and update a house before moving in. Too much stress!! Really interesting point. But no need to stress Andrea. You wouldn’t rashly choose a husband because tall brunette men were in vogue. You would choose on the basis of what makes you exquisitely happy and would find something you could live with for hopefully a long time…both husband and your all important home! It was so sweet of you to feature my laundry room in that third photo. Ha! That couldn’t possibly be mine – it doesn’t have enough yellow & gray & chevron. I’m with you on picking what you love and that it can be something completely different than someone else’s favorites – that’s what keeps the world interesting. Can’t wait to read Darlene’s series. And can’t wait to see your laundry room – all sparkly & stripy & blue. New mantra for me: “I only get to choose so many fabrics, patterns, and colors for my home.” Seriously, thanks for this post. I can definitely relate to decorating paralysis and thinking that if I love a look I need to try it in my house. Besides, sometimes I totally fall for a look in a photo and later realize it’s the 12 foot windows that I love, not necessarily the all white room. (You’ll be shocked to hear that I get through life without 12 foot windows of my own.) Can’t wait to see the laundry room! I’ve been pondering this a lot lately. I have this problem with wanting to buy everything that I like. I’m slowly learning that just because I like it/think it’s pretty, doesn’t mean it has to come home with me. I think it’s because my decorating motto used to be “Buy when you love.” ….and now I love everything. Oops. Haha, your comment said it perfectly. Every decision becomes the eternal question of defining yourself! 🙂 I can SO identify with that feeling! I’m sure the framed wedding photo is beautiful. Thank you 🙂 I have looked at it many time and so far I am still very happy with it 🙂 But you’re right its probably hard to dislike a frame with such a special picture in it! This is so true and so right on! I honestly really do like a wide variety of decorating styles. It’s tough to really nail down what YOU want without the house feeling all disjointed. Good post. SO TRUE! The things I’ve bought for my home because they were on trend are now the things I’m eager to replace. I’ve been trying really really hard to figure out what I will be happy living with and looking at for the next decade or so. I love this post! It resonates with me so much. As a new blogger, I find myself wanting to “people please”, so I find myself considering buying things that I don’t really love or making things I don’t really want to make so that I will get some recognition for them. That’s so not me. I’ve been pulling back from the www. while I think about where I really want to go with the spaces I’m working on. I actually JUST decided to paint my new headboard and footboard black because I like a nice dark nest for sleeping. It may not be “on trend” but it’s what I want and it will be lovely FOR US. If other people love it, that’s a bonus. And my living room has been a dark gold for years, because that’s what I like, not because I’m following a trend. While a nice airy gray and white room can be beautiful, without some saturated color it just doesn’t feel inviting to me. I love it when people like you go their own way with decorating. Thanks for the post! This is JUST what I need to hear today. I too suffer from decorating paralysis and never realized that it was b/c when you do make a decision you are saying goodbye to the other options. Also, we could be decorating twins. I too love (a) teal/turquoise/aqua (and I’ve come to realize that this isn’t a trend… it is just my preference- always and forever– I even have a sapphire engagement ring vs. a diamond b/c of my love of beautiful blues). I also love periwinkle, but more for wearing than for decorating, (b) wide stripes (have navy wide stripes in my guest room curtains), and lastly (you didn’t list this one) (c) natural elements (natural stones, driftwood, etc. etc.). Although I love the look of other people’s modern rooms with sleek lacquer and steel, etc. etc. it just isn’t me. Thanks for the reminder to be real with myself! No, you are not nuts. I totally agree with you. Decorating Paralysis is actually a very apt description! As a Blogger, I find I am bombarded with so many beautiful images of spectacular spaces that it has become harder and harder to recognise what is truly my style and what isn’t. Keeping a note of what you really love and refreshing it in your mind is a very good idea, I might be joining you in this! (P.S I do the laundry, my husband does the dishes and never shall the balance be upset)!! Guess that old saying is true: “too much of a good thing is bad.” I still love looking at beautiful rooms and admiring other styles, designs, etc. but you’re right. It’s really more about finding what works for YOU in YOUR space. That’s easier said than done, but at least it’s the goal. Ah, finally! I completely agree. I feel like the negative of Pinterest is that it tells us what we should and shouldn’t like and then I do it and I wonder why I did in 2 months? I’m trying to do this as well. I’ve determined that I’m a paisley girl. I know it’s not a super trendy fabric, but I’m drawn to it EVERY TIME. I currently have a paisley pattern in the family room, master bedroom, guest bedroom and office. And I love them. 90% of my house was decorated by a hormonal pregnant lady, and that lady (at least the pregnant part) hasn’t lived here for 13 years. Ahhh! The suspense is killing me! I can’t wait to see what you’ve done with the space!!! Awesome post, Kelly! And I totally pegged you for a “teal girl” — it totally suits your happy bright personality! I’ve been loving Darlene’s series… really makes you THINK about things and not just going off gut (or not-so-gut) reactions. 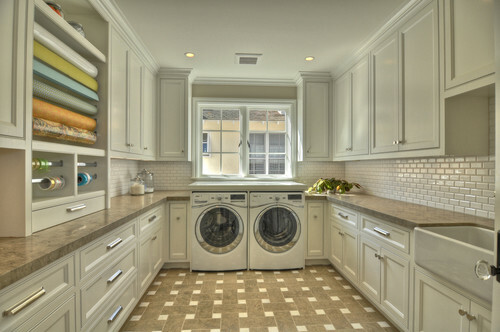 Now, I can’t wait to see your laundry room…. you’re such a tease! Kelly… I really enjoy your input on color. Hahaha when I first saw that laundry room that you posted after the picture of yours, I was like WOW. You had me fooled. I’m sure the real one will look great. I love looking at home decor pictures. Great post. Did you sneak in and steal my brain cells in the middle of the night? Those things you love to look at but will never have – those are mine exactly. Funny, I NEVER think about decorating a whole room. I get a bunch of stuff I like that has meaning to me, and put it together and make a room of it. Hmmm, do you think that is why House Beautiful has never called me? Ha! House Beautiful doesn’t know what they’re talkin’ about. 🙂 I love your decorating strategy! You actually had me for half a second with the “reveal” of the beautiful new laudry room. My jaw dropped a little 🙂 And then spatial memory came into play. Great post – I started getting into decorating and design a little over a year ago and only lately have I started to settle into finding MY style instead of all the pretty photos’ styles. It is definitely a journey and an effort! You are such a great/brave blogger, thanks for bringing some truth out there to the crazy Pinterest-ed blogosphere. My problem is I wish I owned a dozen homes – not so I could visit them – just so I could decorate them!! Talk about getting expensive! I do all the laundry (otherwise my t-shirts would be as tight as if they were worn by Pam Anderson!) and my hubs does most of the cooking!!! Talk about win – win!! Yippie – I get to see the big reveal next week! I am glad I am not the only one who sometimes forgets to “love” my decor choices! These inspiration photos are gorgeous! I am so looking forward to redoing our laundry room too. I love the shade of grey you chose also, thank you for sharing! Im headed over to check out your home tour now, I love a good home tour! I had a sudden heartstopping moment tonight when I thought, “oh, goodness, I never thanked Kelly for her link love,” and looky-there, I was right. I never did!!! So THANK YOU, you sweet thing, for the link love. What a GREAT post series!!!!! A few years late to this party … but we’re doing a master bed/bath renovation and possibly a laundry room. Found your blog on Pinterest and started looking around. I think your closet post is what got me here first, but then I found your laundry room which led me to this post … it’s just what I needed to hear!